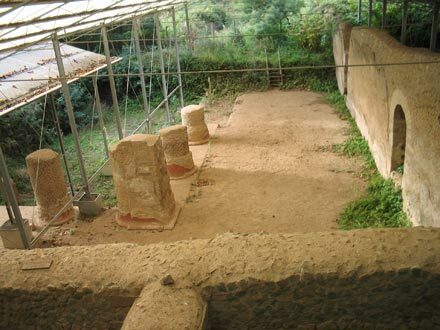 The remains of Ancient Rome's most mysterious and violent cult, dedicated to the goddess Diana, can still be found on the shores of Lake Nemi, near Rome. Archaeologist Ludovico Pisani guides us through the legends surrounding the "Rex Nemorensis", the high priest who was obliged to murder his predecessor. About thirty miles south-east of Rome there is a small town called Nemi, famous above all for its delicious raspberries and the ancient Roman ships of the Emperor Caligula, discovered there in the XV century. However, the shores of the nearby lake were also the setting for Antiquity’s cruellest religious rite in honour of the local divinity, Diana Nemorensis, “Diana of Nemi”, also known as “Diana of the Woods”, an Italian version of the Hellenic goddess Artemis. Her sanctuary was to be found on the northern shore of the lake, beneath the cliffs of the modern town of Nemi (Latin nemus Aricinum). The lake has often been referred to by poets and scholars, such as Servius, as speculum Dianae, “Diana’s Mirror.” Diana is one of the more complex goddesses of mythology and her cult at Nemi was especially violent. The Rex Nemorensis, “king of the sacred grove” was the high-priest of Diana’s temple. The legend goes that in her sacred grove there grew a large oak tree from which it was absolutely forbidden to break off a branch. Only a runaway slave could break one off, thus earning the right to fight the presiding high priest of the temple to the death. If he won, he could take his place, adopting his title of rex nemorensis. This violent rite of succession was based on the premise that the High priest of Nemi, being the personification of fertility and the woodlands (the main features of the Diana cult) always had to be at the height of his powers. He could never be ill, nor could he die of old age. Only a man estranged or debarred from society and deprived of his rights could have possibly wanted this role, which carried with it the certainty of a violent death, but it did at least offer the possibility of asylum for a fugitive. 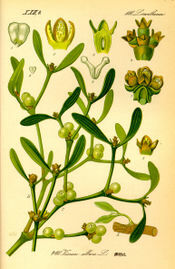 Prior to the deadly challenge, as a sign of his intentions the fugitive/pretender had first to consign to his predecessor a branch of viscum album (mistletoe) that he had broken off from the great oak. (Mistletoe is a species that does not grow from the ground up, but grows parasitically on the host tree, reaching up towards the heavens). So, symbolically it is not like other plants – it belongs neither to the worldly nor the divine realm. James George Frazer, in his revolutionary work The Golden Bough, made the story of the bloody priesthood famous. He interpreted it as another example of a myth found the world over, which tells of a sacred king who must periodically die and be resurrected, or be replaced, as part of a fertility rite. 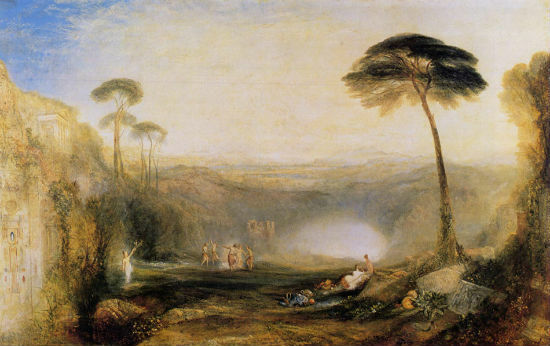 The book’s title was taken from an incident in the Aeneid, illustrated by the British artist Joseph Turner. As in winter’s cold, amid the woods, the mistletoe, sown of an alien tree, is wont to bloom with strange leafage, and with yellow fruit embrace the shapely stems: such was the vision of the leafy gold on the shadowy ilex, so rustled the foil in the gentle breeze. Forthwith Aeneas plucks it and greedily breaks off the clinging bough, and carries it beneath the roof of the prophetic Sibyl. The slave who managed to kill his predecessor became the rex nemorensis, thus earning the right to live and pray until another man, desperate and on the run as he himself had been, presented him with some mistletoe cut from his oak tree. The death of either one of them had to be violent, as the spurting blood from the loser was meant to fertilise the surrounding ground. This ritual certainly continued up until the Imperial era, as the Ancient Roman historian, Suetonius, recounts that Emperor Caligula, angered by the fact that the high priest of Nemi had been in his role for too long, ordered him to be killed by an opponent of greater strength. In the II century AD the fight to preside over the sacred altar became symbolic in nature and the cult of Diana itself began to wane, almost completely disappearing after the advent of Christianity, when it merged, as many believe, into the cult of the Virgin Mary. The origins of the cult of Diana nemorensis are mixed with legend. It is probable that such an unusual and ancient myth on the Italian peninsular had Greek origins. One tradition traces the origin of the rex nemorensis myth to the story of Orestes, the son of Agamemnon and Clytemnestra, the rulers of Mycenae. After having killed his mother and her lover Aegisthus, to avenge his father, Orestes was told by Apollo to go to Tauris to purify himself. Here he met Iphigenia, his sister, who he believed had died, but who in fact had become the priestess of the local divinity, Artemis of Tauris. Given that the cult of this divinity called for the killing of all foreigners, Iphigenia, with a ruse, managed to hoodwink Thoas, the king of Tauris, and escape with Orestes, stealing the effigy of Artemis. During their flight they followed the Greek coastline, and upon arriving in southern Italy they made their way up to Nemi. 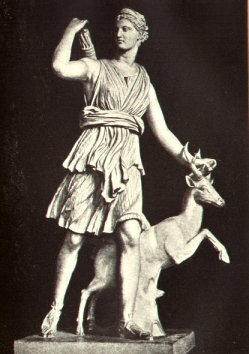 Thanks to Orestes and Iphigenia the cult of Artemis of Tauris took hold in the woods of Diana, again calling for the killing of foreigners on her altar. There is a clear connection between the flight of Orestes and that of the runaway slave, while the mortal combat with the high priest harks back to the human sacrifices of Artemis of Tauris. As with all myths, there is an element of truth in the story. The journey undertaken by Orestes followed the same route used by the Greeks in their commercial trade with the Latins. For there to be Greek origins to Roman myths was not uncommon. The Latins, like the Etruscans, frquently adopted Greek divinities and merged them with their own. According to another tradition, once again of Greek origin, the first rex nemorensis was Hippolytus, the son of Theseus and step-son of Phaedra. Out of revenge for having spurned her sexual advances, Phaedra accused Hippolytus of having raped her. Cursed by his father Theseus, he was sent away, meeting a violent death under the hooves of his chariot’s horses after they had been frightened by a sea monster sent by Poseidon. He was resuscitated by the god of medicine, Ascelapius, and with the aid of Artemis he was transformed into an old man with the name of Virbio, so that he would not be recognised (vir bis in Latin means “man for a second time”). 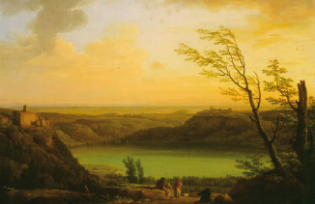 He was brought to the shores of Lake Nemi, to be the priest of the cult of Diana, who was also called Virbia. In memory of this myth, horses were banned from the Nemi sanctuary. In front of the first temple of Diana Nemorensis was a sacred grove in which there stood a carved cult image. The temple was noted by Vitruvius as being archaic and “Etruscan” in its form. It is said that the grove extended over 5,000 square metres. Today little remains of the monumental temple commissioned by the wealthy elite of Aricia in c.300BC, nor can one see much of the huge artificial terrace built a few centuries later, which faced onto the lake, surrounded on three sides by walls which had niches with statues. An earthquake destroyed the temple complex, which by then also included a theatre and public baths, in the second century AD. The locals will of course tell you that the spirit of the rex nemorensis still wanders in the woods around the lake. . . take special care when walking in these parts. Ludovico Pisani is an archaeologist currently studying at the University of Rome. He has worked on a variety of archaeological digs: that of Lucus Feroniae (Capena), Tor Vergata (Rome), Pyrgi (Santa Severa) and Gabii (Rome). He has also worked with the State Department of Archaeology in southern Etruria and Rome. He is currently working with the Vatican Museum.